A good knife is a mandatory requirement for good cooking and that's not an understatement.A good knife is also key to safety in the kitchen and this post will explain why. I have visited so many kitchens, watched and cooked with many homegrown caterers and many a times i have been thoroughly disappointed with the knives so much so that i always carry my chef knives any time i know i will be cooking somewhere ;save for when i am with Chef Kevo of Kevs Kitchen/Mocha Loco . So good people out there as we begin year 2014 make it your resolution to get a good pair of steel knives and this maiden post this year will give you hints on how to select and use a good knife. A good knife should basically enable you to carry out various tasks in the kitchen with minimal effort or exertion.Generally, the length should be between 15 to 36 centimeters and the blade width at least between 1 1/2 inches and 3 inches.Japanese knives have a much wider width length and require good technique in order to fully exploit their potential.The best knives are made of high carbon stainless steel, carbon in them makes them easy to be extremely honed for a sharper edge and the steel removes corrosive effect of carbon.This are generally very very expensive!Dont fall for an imitation that uses this description. 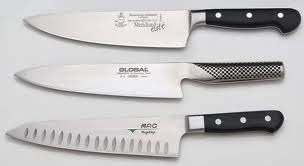 If you are in Kenya , Nakumatt Supermarkets have very good selections of Chef Knives ,the ideal ones are costly and may set you back around Kenya Shillings 2000 to 3,000 bob. However they have cheaper knives Rossetti brand being my personal favourite which go for less than Kshs 1,000/=. Ladies invest in one...there is no excuse for a bad knife! 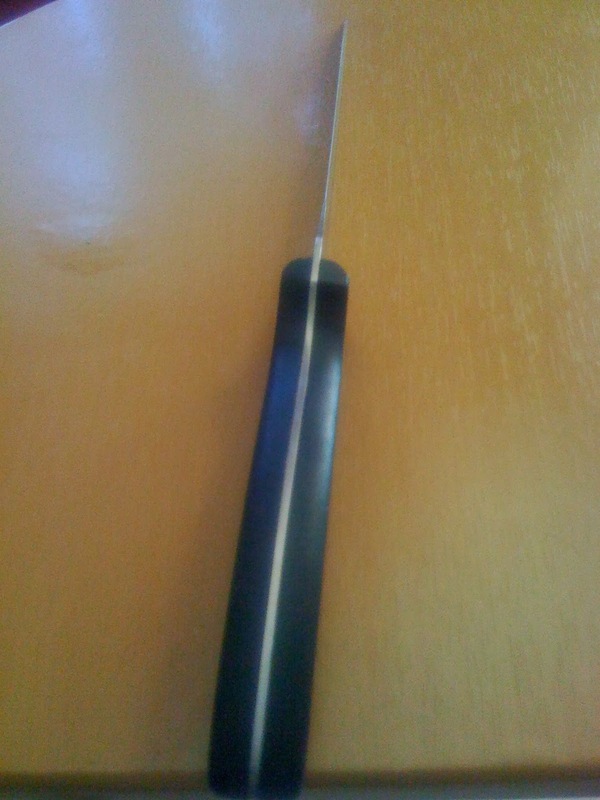 The handles may be steel, plastic or wooden but ensure that the inside blade or tang goes all the way round including the handle(see the picture adjacent )if you are unable to see the blade go all round the handle that is probably a cheap knife and will certainly at some stage prove cumbersome to handle.Invest in a good knife it will give you the confidence and will prove safer when handling.We usually use more energy with blunt objects than with sharp ones that in itself may increase risk cutting oneself.If you have a sharp too and know how to handle it well you will minimize the risk of cutting oneself. It takes less that 10 seconds for a professional chef to gauge if you know how to cook or what you are doing based on how you handle your knife.Now that's a tip that you can take to the bank! Most of us hold a knife as shown above ,while opinion may vary this is basically the wrong way to do it.The best way is to lay the handle flat against the tip of your fingers then roll back closing your fist.No part of your finger should hold the blade.Ensure the tip of the blade is on the cutting board while you raise the handle in a pivot motion.Make sure the knife is balanced and stable then cut with a rocking motion i.e going forward and drawing it backward.This ensures you use the least energy.Learn to hold the handle only ,if need be you may also hold the bolster or "choke up"the knife with your index finger and thumb striding the blade but not on top of it .With practice this may be possible however if impossible to master the technique then you may hold it as above but ensure whatever the technique you are comfortable and relaxed. You also need to know how to handle the items you are cutting ,but that will be a subject for a future post*.I have also not talked of sharpening and honing knives(these two terms refer to two different things ),that will also be elaborated in a future post.For today ,i hope your new years resolution will be to get a new set of knives and that this post has helped in tipping you on how to select a good knife. NB : In collaboration with Prompt Foods we now offer customized cookery listen for Nairobi residents and its environs.Drop a message on our Facebook page for inquiries! Enjoy your new year and lets culinate allez Cuisine(Lets Cook)! This is very interesting article about knives..Information are very relevant. 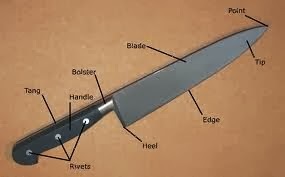 Hi..this article is very useful about knifes. You can also check our list of Best selling Air fryer. Are you looking for a gas water geyser? Click Here to know more details about it. Articles are very much informative and contains all the essential tips about how to keep knives and how to use them differently. Important article for all kitchen lovers. Knives are important part of kitchen so, everyone should read this useful article. Knives help to reduce cooking time. nice article. Knives are incredible tools for kitchen. Awesome article about knives and their working. I read this post.this article is very interesting. So nice article about knives and their uses.plz share more interesting posts. Very interesting article about knives and their uses. Your article is great. Thanks. Thanks for sharing this helpful home appliance.